The Tool Post Gauge consists of a dial indicator with a handy mounting post which allows it to be installed in your lathes banjo. With this assembly you can check the run-out of lathe accessories and of work that you have mounted in your lathe. Its particularly useful for adjusting mandrels such as those employed in pen turning. A pen mandrel with only a few thousandths run-out will cause pen parts to be misaligned and will spoil their looks. After checking the mandrel with the Tool Post Gauge, you can usually bring it into perfect alignment with a few judicious taps from a mallet. 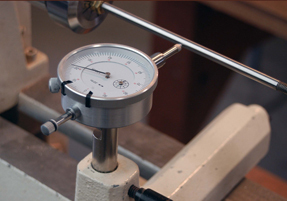 With the Tool Post Gauge, you will be able to test the accuracy of your lathe spindle, as well as that of the chucks or other fixtures mounted therein. Run-out of more than .005 is usually considered excessive for wood lathes, and you will be able to drive your tool supplier crazy with demands for high levels of accuracy. The Tool Post Gauge comes with a 5/8" post for mini-lathes and an optional 1" adaptor that will fit most larger lathes is also offered. The dial indicator is Chinese in origin and the accessories are made in Ohio.